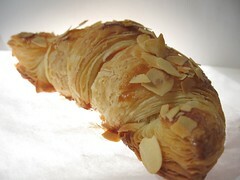 Almond Croissants - Do You Know The Muffin Man? Recipe adapted from Baking with Julia by Dorie Greenspan and The Secrets of Baking by Sherry Yard. Notes: Making croissants is hard. I knew this before embarking on my first attempt so I armed myself with two cookbooks and read various threads on eGullet (here and here). A few years ago, I successfully made Danish pastries and after making puff pastry this summer, I felt equipped to tackle these Viennese/French classics. A disappointing specimen at La Maison du Croissant (avoid) in downtown Toronto further motivated me to try making my own. The first problem was the détrempe from Baking with Julia. It was dry and stiff and resisted all attempts at rolling to the point that I gave up and threw it out. I noticed that its recipe had no butter, so I switched to using the recipe from Yard's book. Since the beurrage was already made (using Lactantia Unsalted Cultured Butter), I sliced a chunk out of it to make the Secrets croissant dough. Ah, much better, smooth and easy to work with. I gave it a leisurely 24 hour rest in the fridge and resumed the next evening. Despite my determined efforts, the initial shape of the dough wasn't quite square which made enclosing the butter block a little challenging. The turns went well and I let it rest 60-90 minutes in-between, a compromise between Yard's 30 minutes and Greenspan's 2 hours. Early this morning, I tried rolling out the dough to the prescribed 18×20 inches. Unfortunately, the outer layer of dough began to split and butter started peeking through. I had to cut short the rolling at around 16×18 inches. My rolling pin is a French one with tapered ends, and my counter space is limited, not the best environment for this kind of work. I shaped using a combination of instructions from the two sets of directions (from Yard: making a small cut on the short side to help give it the crescent shape; from Greenspan, stretching the triangles first to get more length). The croissants didn't have enough rolls as the pastry wasn't thin enough. 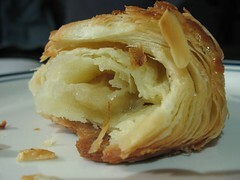 In the centre of each one, I inserted a tiny piece of marzipan. Proofing took about 2 hours. I applied an egg wash then sprinkled toasted sliced almonds on top. As expected, the butter leaked out during baking and formed a puddle underneath the pastries. I needed 30 minutes in total for the croissants to get golden brown. And my apartment was perfumed with the aroma of butter. After resting (and draining) on paper towels while I was at work, the croissants were ready to be sampled when I got home. Definitely flakey and buttery, with crisp distinct layers. A little too much salt though, and I could have used more marzipan in the interior. Maybe some almond extract in the dough too! I can't wait for next time, after I buy some new pants.